Yeah, but: But it's not like subway stations are pretty. The Long Version: It takes a certain amount of faith in Toronto to come up with a merchandising idea for the Toronto Transit Commission, and an even bigger leap to produce them yourself when the TTC rejects it. 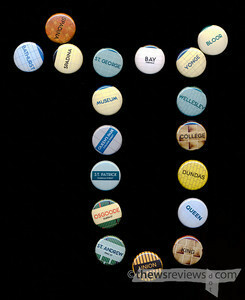 Over five years ago the crew at Spacing Magazine took it upon themselves to make and sell these buttons that take their themes from the tile patterns and names of each of Toronto's subway stations. Available directly from Spacing or through a who's who of the coolest stores in the city, they report that over 120,000 have been sold to date. The buttons themselves are an inch across – even us metric-for-life types still measure in inches – and the colours are a good match to the original stations. There's not much to say about them mechanically; they're decent little buttons, and won't disappoint anyone who has seen one before, but they don't really advance the state of the art of bottondom either. The brilliance is in the concept and the variety, and indeed they've gone on to make buttons of highway signs and the emblems of some of the original towns that are now part of Toronto as well. 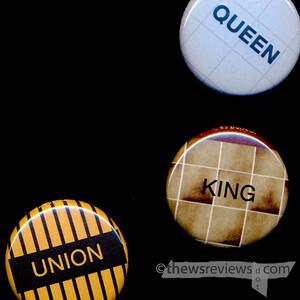 In a further advance, these subway buttons are sold individually, as a complete set, by lines, and even by "ends". The set that I have is the middle end of the system, comprising the lines that cross through downtown. It just happens that this button set comprises pretty much my entire world within this city. In fact, with the sole exception of Bathurst, I pass through each one of these stations every time I commute to and from my day job, including both levels of St. George and both platforms at Spadina. And while I will occasionally venture into the eastern arm of the Bloor-Danforth line, my west-end experience pretty much ends at Bathurst station. Toronto is an unusual city in that its psychology is divided in half by Yonge Street, and people typically stay on one side or the other, rarely crossing it when it comes time to move. Despite our currently living on the western side of Yonge, Penny and I are both east-enders at heart, and being included in Spacing's downtown subway set further insulates me against the hard reality that the street numbers are going the wrong way. 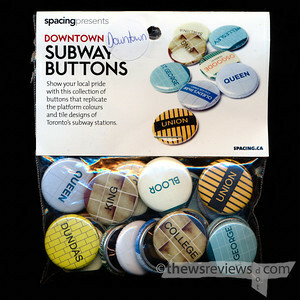 While it's beyond the scope of this review, Spacing has also put their button factory to other good uses. Toronto's inner suburbs have recently elected a mayor who campaigned on the idea of depriving them of decent public transit, so it's no surprise that this has been an entertaining few months of city politics. For example, His Worship decided to kick off his term with a flourish by inviting Don Cherry, hockey's answer to Rush Limbaugh, to be a guest speaker at what should have been a largely administrative event. Nattily attired as always, Cherry's speech began: "Well, actually, I’m wearing pinko for all the pinkos out there that ride bicycles and everything… I’m being ripped to shreds by the left-wing pinko newspapers out there — it’s unbelievable. One guy called me a jerk in a pink suit so I thought I’d wear that for him too today." The answering buttons were inevitable, and available in two versions. Ah, Spacing – where would we be without you? 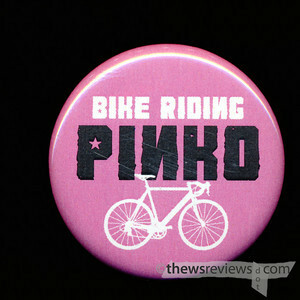 I want the Bike Riding Pinko button. Too bad they don't have an Old Bike Riding Pinko button.